Tiger Woods finished off the PGA Tour season by tapping in for par to win the Tour Championship, a moment that ended any doubts that he could win again after four surgeries on his lower back. And then the moment was gone. Hours later, Woods and 17 other players were headed to France for the all-consuming Ryder Cup. And with barely enough time to digest Europe winning and Patrick Reed pouting, the PGA Tour started up a new season in California. A few nuggets were lost in the quick transition. Justin Thomas tied for fifth at the Tour Championship, and that was enough for him to win the PGA Tour money title for the second straight year after earning $8,694,821, beating out Dustin Johnson by $237,469. That was the smallest margin since Matt Kuchar won by $100,855 over Jim Furyk in 2010. The PGA Tour no longer talks about money in the FedEx Cup era, though Thomas still wins a trophy. The Arnold Palmer Award is given to the leading money winner. 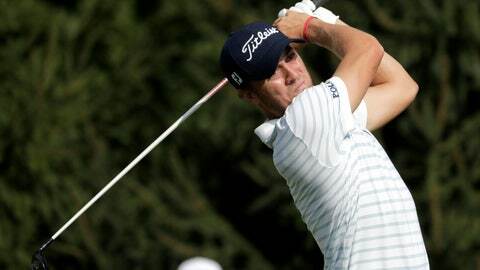 Thomas became the first back-to-back winner of the award since Woods in 2006 and 2007. Johnson, meanwhile, won the Vardon Trophy for the lowest scoring average (the PGA Tour has the Byron Nelson Award, so Johnson gets two trophies). Johnson won for the second time in three years. The first time, in 2016, he wasn’t sure what it was. Brooks Koepka won PGA Tour player of the year, which was no surprise considering his two major championships. The only time someone won two majors and was not PGA Tour player of the year was in 1990, when Nick Faldo wasn’t a PGA Tour member. For the first time in 10 years, the tour’s three main awards were won by three players — Koepka, Thomas and Johnson. In 2008, Padraig Harrington was the player of the year, Vijay Singh won the money title and Sergio Garcia won the Vardon Trophy. Singh won the money title by $826,094 over Woods while playing 17 more events. That was the year Woods had season-ending knee surgery in June, so he was ineligible for the Vardon Trophy (Woods played only 20 rounds). Harrington won two majors that year. The Tour Championship was his 80th victory, which was well documented even with all the attention on the Ryder Cup. He also improved his record to 44-2 when leading going into the final round on the PGA Tour. Also worth noting is that Woods joined Johnson and Rory McIlroy with his fourth FedEx Cup playoff victory. The victory also meant Woods has won five tournaments in three decades — Firestone, Torrey Pines, Memorial, Tour Championship and World Golf Championships at Valderrama in 1999, Ireland in 2002, Atlanta in 2003, Harding Park in 2005, England in 2006 and Doral in 2007 and 2013. Bob Tway was 50 when he played his last PGA Championship, making the cut at Hazeltine in 2009 and tying for 56th. He never returned, even though Tway has a lifetime exemption from his 1986 victory at Inverness, where he holed out from a bunker on the 18th hole to beat Greg Norman. Now it appears he will be heading back, all because he has company — his son. Kevin Tway’s victory in the Safeway Open earned him an exemption to the Masters, but it also gets him into the PGA Championship in May at Bethpage Black. Kevin Tway has played the U.S. Open three times but never the PGA Championship. Phil Mickelson is bullish on the future of the Safeway Open when the shortened PGA Tour schedule takes hold. Whether it measures up to perennially strong fields at regular PGA Tour events — Riviera, Quail Hollow and Muirfield Village, for example — remains to be seen. The PGA Tour season ends on Aug. 25 next year, and there likely will be a break before the Safeway Open. This year, it was two weeks after the Tour Championship and, for Mickelson, the week after the Ryder Cup. It showed in the weak field. It was the first time since July that the European Tour (Scottish Open, one week before the British Open) had a stronger field than the PGA Tour. Mickelson at least has shown a change of heart. It was in February 2015 when Mickelson explained that fall events won’t get Ryder Cup points because “you’re giving the bottom half of the tour a three-month head start over ultimately the top guys.” So maybe a few weeks will make a difference. It’s also worth noting that eight months after Mickelson made those comments, his management company took over the Safeway Open. Mickelson played in Napa the following year — his first fall event in a decade — and has not missed it since then. The PGA Tour will spend the next three weeks in Asia, which can pay off for those willing to travel. For players like Joel Dahmen and Sam Ryder, it will be their first tournament without a cut in the CIMB Classic. For players like Pat Perez, who won the CIMB Classic last year, it can set him up for the rest of the year. Perez earned 56 percent of his regular-season FedEx Cup points from the CIMB Classic, CJ Cup in South Korea and the World Golf Championships event in Shanghai. Perez was among 16 players who took part in all three stops in the Asia swing. Also at stake are world ranking points, especially for those close enough to the top 50 to think about the Masters. The top 50 in the world at the end of the year are invited to Augusta National. Perez is at No. 56 and not yet eligible for the Masters. Others outside the top 50 going into the Asia swing are Russell Knox (No. 58), Ryan Moore (No. 61), Kevin Chappell (No. 63) and Peter Uihlein (No. 66). All but Knox are playing in Malaysia. Thomas Pieters is playing the CIMB Classic on an unrestricted sponsor’s exemption. Pieters took PGA Tour membership last year but failed to play the minimum 15 events. He would have to wait a year before joining the PGA Tour. … Justin Rose will have a chance to return to No. 1 in the world this week at the British Masters, where he is the tournament host at Walton Heath. … The USGA is increasing the field for the U.S. Junior Amateur from 156 to 264 players starting in 2020 at Hazeltine. The idea is to allow for more exemptions that will attract the best juniors from around the world. Pat Perez earned 56 percent of his regular-season FedEx Cup points from three tournaments in the Asia swing, most of that from his victory in Malaysia. “It was nice to start or end the year, however you look at it.” — Phil Mickelson after his tie for 17th in the Safeway Open, the first PGA Tour event of the new season and his last PGA Tour start of the year.